Enteral nutrition formulas are very important when you are not able to eat or digest food normally. Just like regular food, your tube-feeding formula will provide calories and essential nutrients, such as protein, carbohydrates, fat, and vitamins and minerals, to help you maintain sufficient nutrition. The location of your feeding tube can vary. 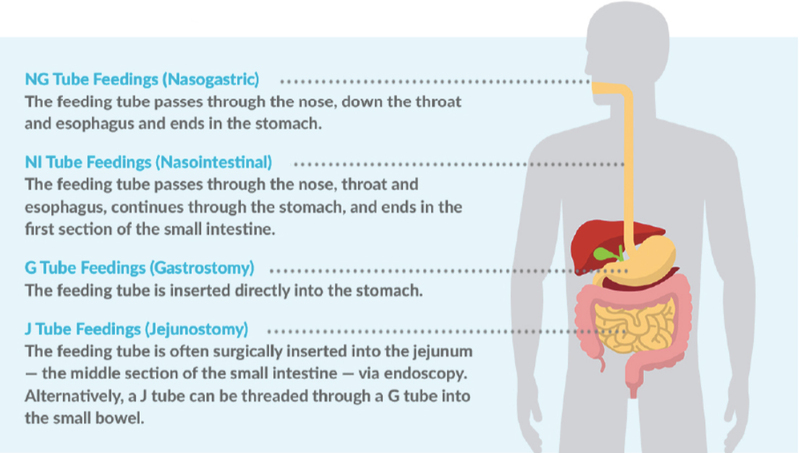 There are several different locations where a feeding tube may be placed. Each of these locations allows the nutrients in the formula to be used by your body just as if you were eating a regular meal. In addition to the location of your feeding tube, there are different methods in which your tube-feeding formula can be administered such as bolus feedings and trickle (trophic) feedings. Supplemental Tube Feedings are exactly what they sound like - supplementing the diet by consuming enteral nutrition (tube feeds). This can be given in a variety of ways. For example, bolus feedings are usually given during different times of the day while continuous feeding can be infused overnight while sleeping to help meet nutrient needs. Volume-based Feedings are based on the total volume of formula per day prescribed by your healthcare professional. With volume-based feedings, you track each feeding toward a total daily feeding goal.